RIO DE JANEIRO, BRAZIL – President Dilma Rousseff and U.S. President Barack Obama made it clear they hope to strengthen relations between the two countries. Obama, on his first presidential Latin American tour, praised Brazil as a model of democracy, and complimented the country’s flourishing economy during his visit. Presidents Rousseff and Obama meet in Brasília, photo by Antonio Cruz/ABr. After meeting in Brasília, in a joint press statement Rousseff and Obama defined that they are seeking opportunities for Brazil and the U.S. to work closely together in the fields of technology, aviation, and clean energy. Both parties voiced concerns about their respective trade barriers, and the U.S. has ground to recover since China is now the number one buyer of Brazil’s exports, and the country’s largest trading partner. Perhaps Rousseff’s most challenging political goal was gaining U.S. support of Brazil’s bid to become a permanent member the UN Security Council. She did not get direct endorsement from Obama though, who only went so far as saying he was in favor of UN reforms. Some speculate it is an effect of of former Brazilian President Lula diplomatic support of Iran and it’s Nuclear policies. 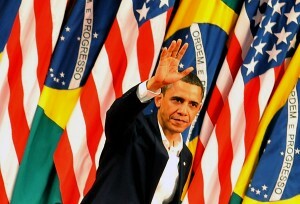 Obama waves to public at the Theatro Municipal in Rio de Janeiro, photo courtesy of Valter Campanato/ABr. Obama however made clear that Brazil is no longer seen by the U.S. as an emerging country. “This is a country of the future no more. The people of Brazil should know that the future has arrived. It is here now,” said Obama in his speech delivered at the Theatro Municipal. Obama, First Lady Michelle and their two daughters Malia and Sasha, arrived in Rio de Janeiro on Friday night, after the meeting with Rousseff. Security was tight, with army tanks in the city’s center, helicopters in the air, and hundreds of police and military troops patrolled the streets of Rio. Notwithstanding some protests against the United States foreign policy and involvement in the military actions against Libya, Obama is hugely popular in Brazil. U.S. President Obama, First Lady Michelle and their two daughters Malia and Sasha visit Christ the Redeemer, photo by Valter Campanato/ABr. Obama was able to feel some of the Brazilians enthusiasm during a visit to the favela Cidade de Deus (City of God) made famous by the hit film of the same name in 2002. For two years this favela is one of the so called “pacified” communities, were the special Police Pacification Unit (UPP) make sure the area remains out of the hands of heavily-armed drug gangs or corrupt militias. While few doubt the improved conditions of the UPP occupied favela, critics voiced frustration that the scene of peace and safety was grossly overstated. 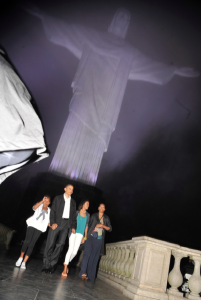 To close the Brazilian leg of the five-day Latin America tour, the Obama family made a visit to Cristo Redentor (Christ the Redeemer) on Sunday evening. A symbol of Christianity, the 130-foot statue is an icon of Rio and Brazil, which has the largest number of Catholics in the world. Both Brazil and the U.S. hope the visit will signal the start of improved ties between the two countries. Before departing for Chile, Obama told Rio Governor Cabral he hoped to return soon. Cabral said he would be delighted to welcome back the American president for the World Cup 2014 and the Olympic Games in 2016. Obama, to my mind, has become a bit of a lame duck as the US President. When I watched him during his campaign trail, he reminded me much of the Late Martin Luther King. Now though, that he has had the reigns for quite some time, it is clear that he’s great at one thing only: making speeches and addressing his flock. Ironically, now that the US has taken the lead on the Coalition’s UN sanctioned attack on Libya, it seems that there has been a tremor of sorts, lending some sort of gravitas and credibility to Obama. Unfortunately, the US, as a society, is mortally wounded both economically and politically. China has overtaken the US in terms of international business in many senses, and from the point of view of the rest of the planet, the world no longer needs a Big Brother policeman. So Obama is now doing his rounds and mustering up support for his ailing nation. The thing is, when it comes to the US, there is always an agenda, and clearly, on this road-trip, the US’s agenda with Brazil is to strengthen trade with the US, which has already been relegated to second place behind that of China. Then again, US banks did provide most of the funding to build Brazil in the 1970’s when the world economy was flush with good old petro-dollars, so possibly a bit of gratitude on the side of Brazilians is required?! My advice to Rousseff is to cut a sweet deal for Brazil, as Brazil these days has the odds stacked in its favour and wields an enormous amount of international economic clout, and the US is left wanting on the score of cash rich friends at her dinner table. Don’t sell out Rousseff, and remember, when it comes to the US, it’s a case of: once a bully, always a bully! I think she could take him. He might be younger but she definitely has him in the weight category.